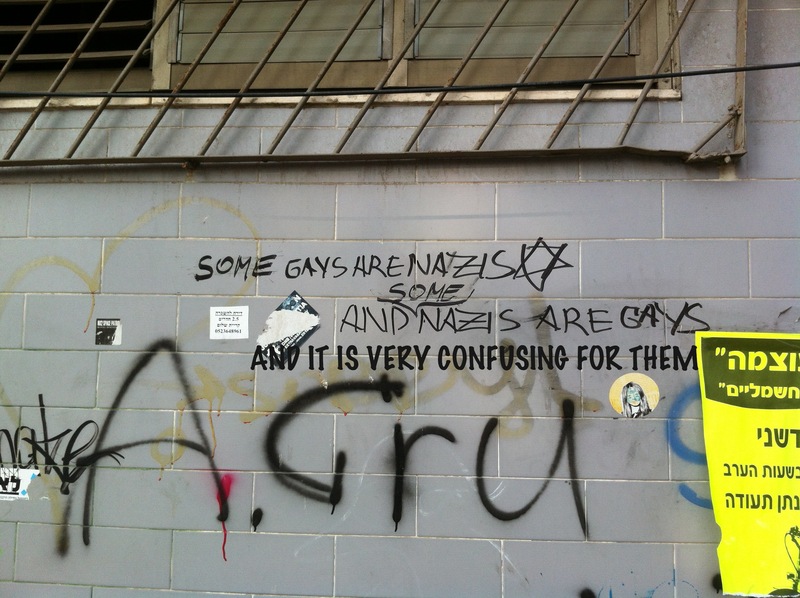 After glancing at it a second time, I realized that it was sprayed by two different people (ie., the original, “Gays are Nazis and Nazis are Gays” was re-tagged and completely altered by the addition of two “Some”s). And I was minorly blown away. Ok, sure, fine, I’ll explain. Even as we are trying to combat ignorance, stereotyping and collectivization, we end up doing the same thing, and making statements that, despite their best intentions, are untrue, and in some cases even absurd: If I respond to someone who tells me that “Palestinians are violent” by saying “Palestinians are not violent,” I end up saying something that isn’t true, faltering rhetorically and allowing myself to be dragged down to the level of collectivization. *I realize that using the correct Italian singular form of “graffiti” may make me sound like a complete tool (“Well, I do say, Quinton, did you perchance happen to notice the scandalous graffito outside of our mansion?”). And yet, I can’t not: it is an unbearably charming and pleasing word. And yes, I would love a panino. **Social groups as contrasted to political groups or ideological groups, ie., I think it would be way less problematic to say “KKK members are racist” or “Politicians are corrupt,” and even in those statements, the group is being described not as being a certain way but as acting a certain way: KKK members have the option and the capacity to stop being racist (in this case, by forgoing membership). ***Rather than behave a certain way. Saying: “Settlers are hateful” is wrong, collectivizing and absolute unverifiable. Saying “Settlers are benefiting from a system which separates and discriminates between national groups” has a better shot at hitting on truth. Excellent indeed, and so are singulars :). 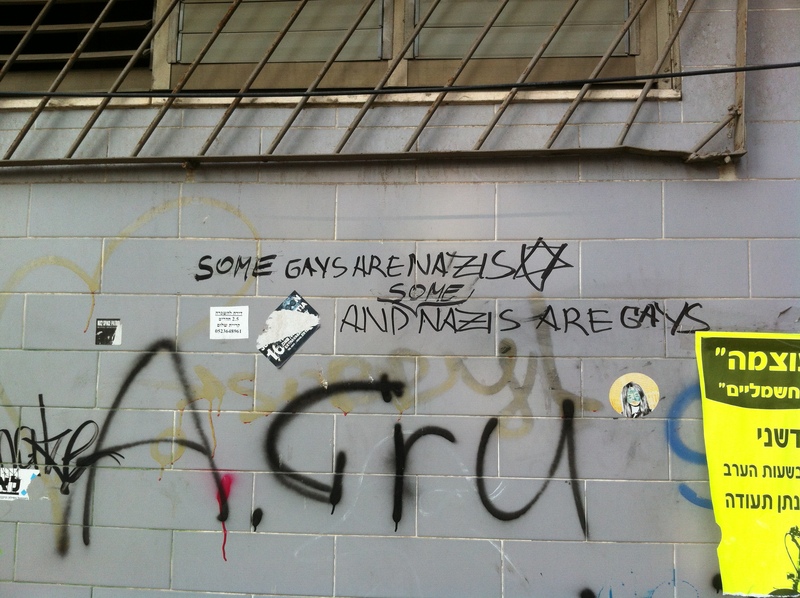 I can assure it we regularly use it to describe one piece of spray-paint writing on a wall (un graffito, due graffiti). And I really appreciate that you made that *** note, it prevented me from quibbling. Generally, good food for thought (un panino per la mente?). Thank you. S– Amazing comment! Made me smile, both from the lingual validation, and the affirmation that the footnotes and internal-dialoging is useful rather than overkill. :) And yes. Un panino per la mente, for sure! This is excellent stuff. I’d like to make it compulsory reading for all the vehement supporters of the Palestinian cause who sometimes sort of forget that ‘some’ Israelis are, amazingly, not oppressors. By the way, I don’t go into cafes advertising ‘paninis’ because I make the wild generalisation that not even some of them can tell their panino from their elbow. With love and best wishes for 2014. I have been turning this over and over again in my head. I’ve also been playing it against this other blog post I recently read, http://battymamzelle.blogspot.com/2014/01/This-Is-What-I-Mean-When-I-Say-White-Feminism.html#.UtBGy2RDsb4 – which argues (among other things) that demanding decollectivization is a privilege of the – well, privileged. I’m not saying your point is mutually exclusive with hers, in fact, I think when one is talking about Palestinians, or gays, it’s necessary. But the juxtaposition of your blog post (which I thought was brilliant) and hers (which I thought was brilliant) leaves me wondering where decollectivization is useful and where it’s a red herring. I’d love to hear your thoughts. First off, thank you for your comment and for sending me the link to this blog post (I also thought it was great). I am going to posit a way in which the two posts, hers and mine, might not be in tension– I think a distinction I am tried to make is between collectivizing social groups and collectivizing political groups: the former is never OK, while the latter may well be important, as in the case of the posts collectivization of “white feminists” which is a political/ideological/behavioral group rather than a social group (it would be different if she said “White Women,” which she very much doesn’t. I think, in fact, that she actually completely decollectivizes with her diagram, allowing for an entire category of feminists who are white that are not necessarily White Feminists (and further decollectivizing by stating at WoCs can be White Feminists). Thoughts? I agree, theoretically, and I don’t think they’re in tension – but “Nazis” are a political group, yes? So where does the distinction between social and political break down? Right! With Nazis, I think it is OK to collectivize political groups (Nazis are violent; Nazis are hateful, etc.). Your question is an excellent one, though, as to where the breakdown between social and political groups is, and calls for another question, that builds from this: what form of collectivization of political (or political-ish) groups crosses the line? Some challenging cases off the top of my head are those in which political collectives are just code for social collectives. Let’s say someone says, “Hip Hop artists are thuggish.” They probably mean to say, in some form, that “Black people are thuggish.” With that, if someone says, “Hip Hop artists are misogynistic,” it is more complicated (I think? Maybe it’s not! Maybe they are still collectivizing Black folks, and I think that that statement, too, shouldn’t be allowed to stand without a “some”). Or maybe, it’s okay to collectivize about a group when one is describing something about the group’s self-defined “platform,” and no one would be in the group if they didn’t mostly identify with the platform. Hence “Zionists are ethnocentric.” “White feminists have a narrow focus that doesn’t liberate WoC,” makes sense, whereas it is very difficult to make collective statements that are accurate about, say, women or Jews or Palestinians, as people who get lumped into those groups largely aren’t by virtue of a shared platform. Yes!! Let’s co-author something about this at some point?